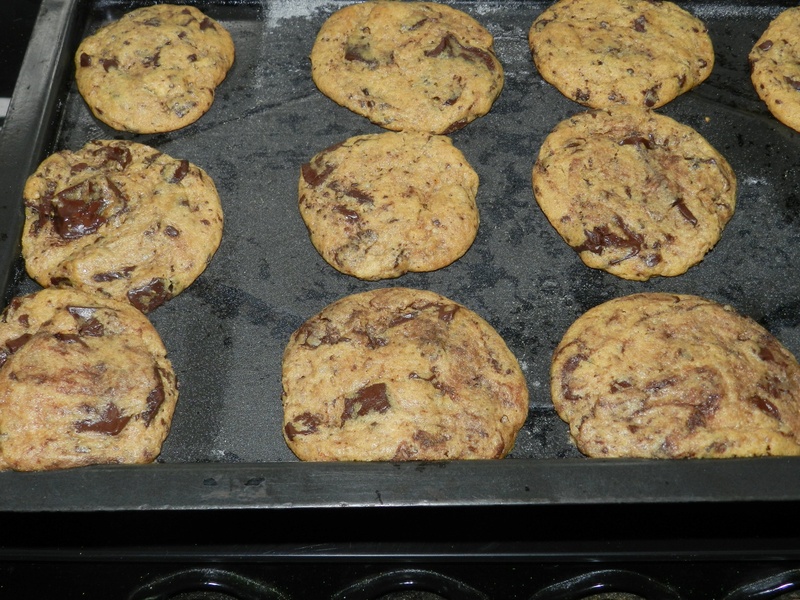 Of farewells and chocolate chip cookies…. There comes a time when all your friends are moving out of the city you all grew up in to study or to work elsewhere. That’s what has been happening to me and my ‘school friends’! I was in a huge rush to get my Masters, so I was back in the city at the time when everyone was considering options to move abroad to study. One of my best friends left on Tuesday to pursue her Masters and I had to call her over to feed her some of my cookies and to have a ‘last’ long conversation with her. Obviously the part about having the ‘last’ conversation is so untrue especially since we both looove Skype! Skype is a genius tool! I know that there are probably other video chatting/voice chatting devices available, but Skype remains my favorite. Maybe it’s because I have some wonderful memories attached to it. So anyways, I had just been telling her about how people love my cookies and brownies and she insisted I make her some before she left India. So, we decided to have a small pani-puri party with warm chocolate chip cookies and vanilla ice cream for dessert. For those who don’t know what pani-puris are- they are typical North-Indian street food consisting of a mint and spices flavored water, boiled sprouts and potatoes with masala and a tangy tamarind chutney stuffed into small bite-sized fried ‘canapes’. Pani (literally meaning water) puris are a sure hit at any party! ous chocolate chip cookies. Its a recipe I will use anytime I wanna cheer any one up including me! I like to pretend I make things healthier because I use whole wheat flour instead of white, processed flour. The sugar and the butter still are there, and I am actively looking for healthier substitutes for them. If you know of any, please let me know. I left the dough in the fridge for bout 30 hours since I have heard that cookies come out chewier in the center and crispier on the sides when you chill the dough for a few hours. The cookies were definitely chewier but I can’t really comment on the crispiness. Substituting the all purpose flour and using whole wheat flour did not make any serious difference as far as taste is concerned once the cookies have been baked. 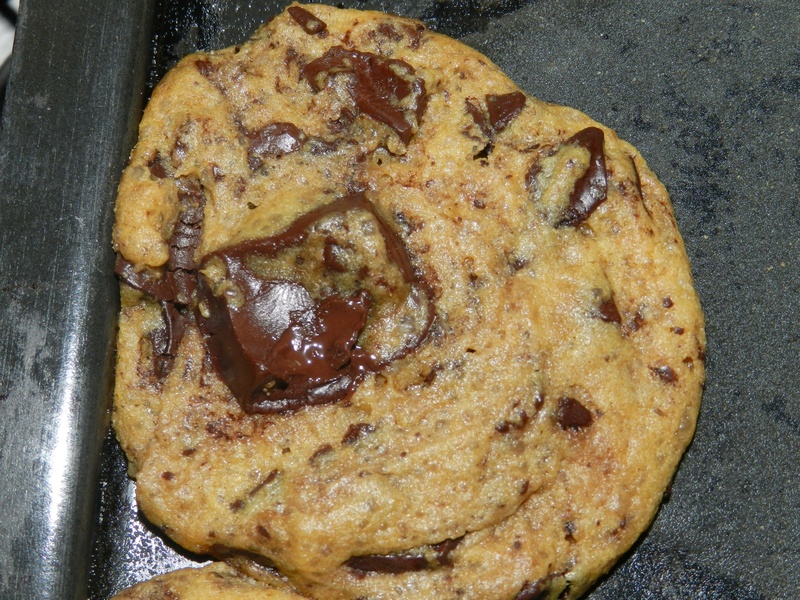 However, cookie dough made with whole wheat flour is not as delicious as the one made with all purpose/processed flour. I used salted butter since I did not have unsalted butter on hand and perhaps the only difference I noticed was that the cookies seemed to spread a little more on the cookie sheet. However, the more I read about it, the more I realize that to control the amount of salt in a recipe, it is always better to use unsalted butter. I made some oatmeal cookies using the ‘Amul’ brand of butter, and they turned out horribly salty. If you are in India and want to find a less salted butter, please use the ‘Gowardhan’ brand of butter instead. I decided to use vanilla bean paste in this recipe since I had recently bought a pot of it, but I would not recommend using it only because you can’t get the full flavor of it. Since vanilla bean paste is quite expensive compared to vanilla extract, I would rather use it for recipes where vanilla is the principle flavor! While I am going to miss Jyotika very, very much- I am happy to see that she is on her way to achieving her dreams. I know she is going to do great and have full faith in her. I am glad she enjoyed these cookies and I hope that she takes many happy memories of this evening with her.